A suite of tools for increasing the operating system performance. WinTools.net cleanly removes unwanted software from disk drives and dead references from the Windows registry. WinTools.net puts you in control of the Windows start up process, memory monitoring and gives you the power to customize desktop and system settings to fit your needs. Adds more speed and stability for your connection. Please contact us with the contact form to report difficulties, strange behaviors or persistent problems, and quote the program name or the number 22981 . This is the download page for WinTools.net Professional - A suite of tools for increasing the operating system performance. WinTools.net cleanly removes unwanted software from disk drives and dead references from the Windows registry. WinTools.net puts you in control of the Windows start up process, memory monitoring and gives you the power to customize desktop and system settings to fit your needs. Adds more speed and stability for your connection. Ensures your privacy and keep sensitive information secure. 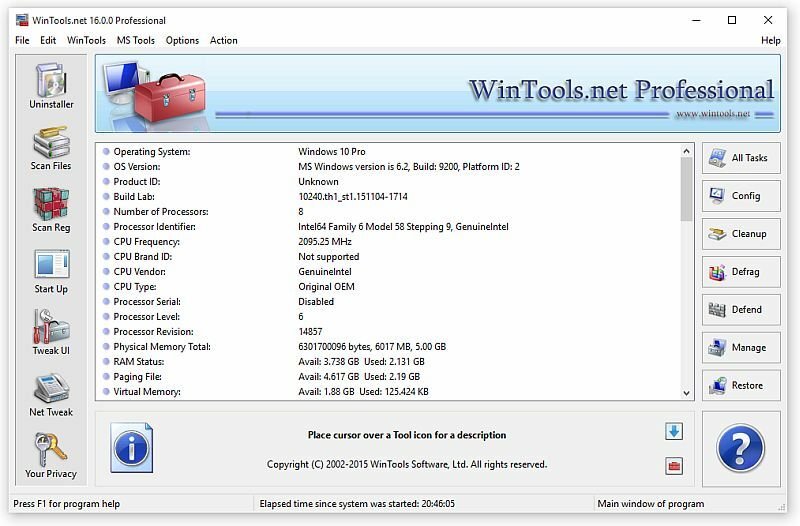 WinTools.net Professional contains tools: Clean Uninstaller, Scan Files, Scan Registry, Start Up, Tweak UI, Net Tweaker, The Privacy.